when i go to sleep at nights, my cellphone (acting as my alarm clock, can i get a show of hands as to who else does this?) is on my right side, but when i wake up in the mornings, i like the cellphone on my left side. why is that? maybe because i have my glasses on the left side. or maybe i'm just crazy. upon that realization i woke up earlier than usual on this monday morning and got ready for work, the first day after the patriots' victory last night. i was almost expecting to see overturned cars in the financial district, aftermath of the postgame celebrations that swept some parts of collegiate boston. 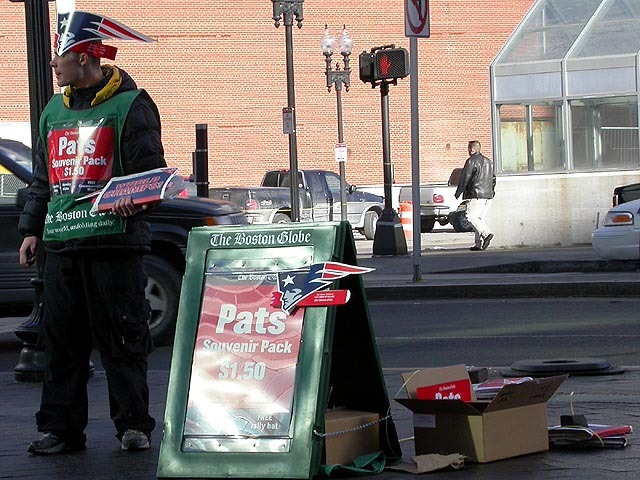 unfortunately, the area around south station was quietly subdued. monday morning is when you get together with your coworkers and discuss the events of the weekend, and the superbowl was the topic du jour in the squid office, everything from the game, to janet jackson's half-time wardrobe malfunction (which i missed), to the commercials. lisa was back at work in the office, and we went to the apollo grill for lunch. 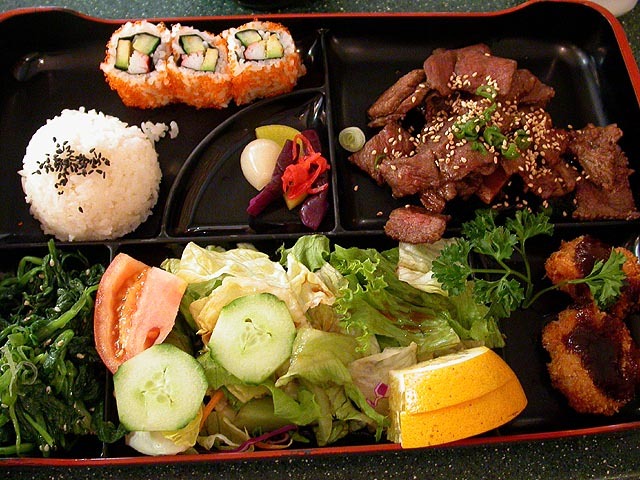 i got the kalbi ribs box lunch while lisa went with the sushi combo. we had a table by the front of the restaurant, my very first time, usually the waitress sits me in the back like she's ashamed of me or something. lisa and i talked about the state of programming jobs out on the market, the kind of work available for lingo and actionscript programmers. the excitement back at the office was that carly's imac suddenly died, the machine just wouldn't boot up, despite the fact that the hard drive was fine after alex removed it and transplanted into another mac. we stripped the imac for parts (battery, memory) and installed them into a biege G3 for carly to use temporarily until we can get her a new computer. i left work around 7pm and came home, digging through recipe books looking for something to make, perhaps not for tonight, but definitely for tomorrow. after i selected the recipe (burrito with rice and chicken), i headed out to star market to buy the ingredients, picking up a chicken pot pie for tonight's dinner. brings back memories, growing up, i ate out of a toaster oven, chicken pot pies, tater tots, tv dinners, stoffer pizzas. as a matter of fact, it was through these instant prefabricated meals that i was first introduced to american style food. that, and school lunches.